Damp can be a real problem, especially if it begins to affect your home, garden decking or other wood-based structures. Left unattended it can become a real issue, and in the case of caravans which can be neglected for a large part of the year and regularly subjected to the elements, it can cause untold and expensive damage trying to remedy. Wood you might store for your fire or log burner may also be too wet if you have to leave it outside, meaning that it just won’t burn hot enough to keep you and your family warm over the harsh winter months. It’s not just that though, if you do intend working with wood as part of a design project around your home or garden, you will want to ensure that it is fit for purpose and not damp or rotten before you even begin to use it. That’s where a moisture meter can be a really convenient little device. While it might not be the most exciting gadget ever designed, it is certainly a highly practical and useful one for anyone who regularly deals with wood. They’re inexpensive and can be critical in the early detection of damp and also help you to maintain a dry wood store. So let’s take a look at the best moisture meters available on the market today. For almost a century now, General Tools have been producing precision specialty tools and have an extensive range of over 1000 tools regularly used by tradesmen, craftsmen and a fleet of dedicated DIYers from all four corners of the globe. Stands to reason than that they would have a moisture meter as part of their enviable line-up and that it would make it onto our best moisture meter review. In fact, we’ve made it our Best Choice today. 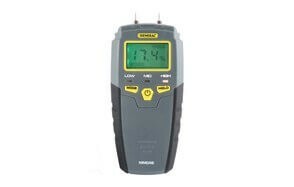 The General Tools MMD4E is a pin type meter which features an LCD display. It’s best for facility maintenance, home remodeling, and restoration, inspection services as well as general woodworking purposes. Water damage can be the first sign of mold and serious trouble ahead so early detection can help with longer term prevention. The key to stopping mold in its tracks before it ever gets a chance to develop is to find any problematic moisture early on. If humidity goes undetected for long periods of time, it can cause havoc around the home and lead to harmful mold growth among other things. The General Tools MMD4E Moisture Meter uses pin sensors which can easily be placed into the wood you want to check, to monitor and record the level of moisture content present. The benefit of this being that you can make a decision to dry out or remove the affected materials entirely before the issue worsens. It’s easy to use, a cost-effective purchase and could end up saving you time and money in the long run by detecting and determining early on what remedial action is required to fix any existing damp. Use the water meter to check the water content of any wood before you purchase it and also as a water leak detector following any flood or general water damage. It makes the perfect and cost-effective water meter tool for woodworking, building construction, and agricultural industries. Make sure you also check out guides to the best infrared thermometers. We’re staying with General Tools for our next product recommendation which is there MMH800 combination style water meter. This 4-in-1 meter can be used both pin or pinless and has two displays to monitor moisture percentage as well as temperature and ambient humidity. 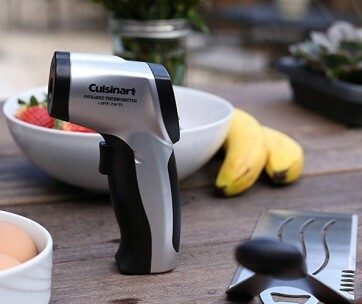 The beauty of that dual-use pin/pinless function is that you can get both accurate and precise moisture content readings as well as scan a large area quickly. That way you can make a very informed decision on whether you need to just dry or fully replace an entire affected area. Scan large areas of drywall and wood quickly with the pinless lad sensor, then once you’ve detected moisture patches, simply flip open the cap to expose the pin sensors and take a more accurate and detailed, localized moisture content reading. The General Tools MMH800 is perfect for locating water leaks too and for measuring all kinds of moisture content levels, not just in wood, but also in drywall, plaster wall, carpeting, flooring, brick, grout, and even soil. It really is multi-functional water meter tool in every respect. There’s an easy to read and highly visible dual LCD display as well as an audible water detection alarm. The audible alarm has a High, Medium and Low indicator, so you know automatically what you are dealing with. The moisture reading level can also be held for convenient viewing at a later stage without losing your results. It’s a streamlined and ergonomic looking unit which is easy to use and operate and comes with a lanyard so that you can conveniently carry this combo moisture meter around your neck plus a spare set of pins are also included. It’s also battery operated and has an auto diagnostic check and an auto power off. 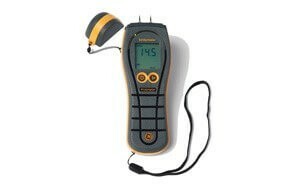 This unit can also provide moisture reading from 5% to 50% in wood and 1.5% to 33% in building materials. It’s accurate +/- 3% for moisture and +/- 5% for humidity. Overall this unit is ideal for leaving water leaks and for measuring the water content in a wide range of common surfaces and materials. 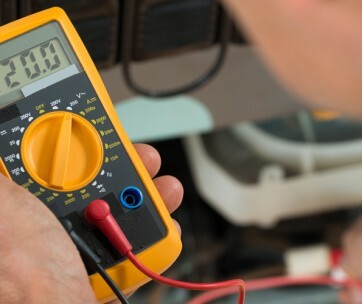 If you love buying handy tools, check out our guide to the best multimeters. Up next, our best water meter recommendation comes from Calculated Industries and is their 7440 Accumater XT Digital meter. This has been designed for use on more than just wood and can also be used to detect damp in walls, ceilings, carpet as well as firewood too. You can effectively use this powerful and inexpensive little device to find hidden leaks in all kinds of walls and surfaces around your home, caravan, mobile home or any site where you might be working. Check that your firewood is ready to burn or that any lumber or hardwood that you are using for woodworking is the optimum condition for use. By checking first the moisture content of any wood, you can avoid any unnecessary cracks, splits and potential warping of the wood you are using. With super sharp pins, you can quickly and easily see if your moisture content is Low (5-11%), Medium (12-15%) or High (16-50%). Not only that, but the Calculated Industries 7440 monitor is stacked with extra features and benefits. It’s easy to use and has a sturdy and hand-friendly look and feel which is solidly dependable. There’s a large easy to read backlit screen and also a convenient freeze function which records and holds your reading so that you can reference back to it at a later stage. The moisture levels are indicated by both icons as well as an audible sound plus there is an automatic shut/off function. There are also built-in calibration test pins, and a 9V battery is included. The real beauty of this moisture meter is that you can check moisture content before it has a chance to become problematic and potentially costly too. Another cost-effective solution to detecting water moisture levels in wood, this Dual Meter from Sam Products comes with 4 sensor probes and is a pin style meter with a digital LCD display monitor. The Sam Pro Dual Moisture Meter can quickly test for moisture levels as well as the temperature in all kinds of wood, concrete as well as other equally used building materials. It’s not just useful for registering moisture content, but it can also be used to detect any water damage caused by floods or leaks as well as indicating whether building materials are dry and safe to use and seasoned firewood is suitable for burning. Operating the unit couldn’t be easier. Simply take off the protective cap, press the power button and then go ahead and selected the material type. This is a convenient function that not all moisture meters contain and can certainly speed up and make the process of checking your materials more accurate and efficient. All you need to do next is go ahead and push the pins directly into the wood or other material that you are measuring, and after a couple of seconds, the result will be recorded on the LCD screen. With a backlight, you can also take measurements in hard to reach spaces and various indoor and outdoor locations. There’s even a Min and Max display features too. Besides providing a moisture reading, you can also check on the air temperature thanks to a built-in sensor. The unit conveniently comes with its own travel case so that you can take it with you on various jobs and different site locations plus there’s a comprehensive owner manual, and it also comes complete with a 9V battery. This is the tool you’ll want to have handy in your tool box. Our next best moisture meter looks a little different to the others we’ve so far reviewed in that its designed and shaped like a pen so is super portable and was to carry in your pocket. Better still, it also functions as a flashlight, and so it’s absolutely ideal for builders, inspectors, remodelers and all kinds of contractors. It provides a reliable and accurate reading and is budget friendly too. The Flir MR40 Moisture Pen is so easy to use and comes with a spare set of pins. It may be small and compact, but it’s not lacking in power or reliability and has a bright LCD display along with an audible indication too. There’s an easy to operate On/Off button as well as an Auto Power Off function and it has a rugged and portable design which means you can conveniently carry it with you anywhere. Small and discreet enough to place in a pocket, it can help you take measurements in difficult to reach spaces and also happens to be splash-proof too as well as drop tested to 3-meters. As with the other best moisture meters which we’ve so far reviewed, yet again this features a “Hold” function so that you can record and evaluate a reading at a later stage. It’s easy to use, totally portable and can quickly find and quantify and potential moisture problems. Make sure you always keep it handy on your tool bag. The final product recommendation in our best moisture meter review is one for the Pros among you who appreciate that having access to the best tools can make all the difference. 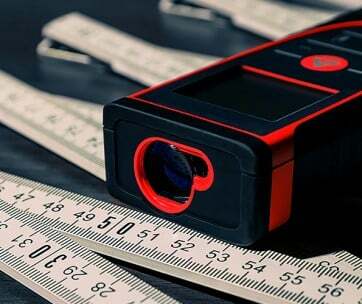 From Protimeter, the BLD5365 SurveyMaster has been improved and enhanced by the company and is ergonomically designed for easy, one-handed operation. Great news if you are assessing water damage or checking for moisture content on a building site or other such structure. This is a versatile meter featuring the option to use with pins or in a non-invasive way. It’s ruggedly constructed and has been designed to last for years to come. It comes with a wide range of accessory plugins and also features a 2-years warranty. 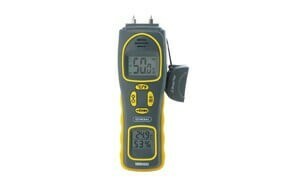 This Protimeter is definitely the professionals choice and has a price tag to match. It’s not one for the hobbyists or occasioned home DIY’ers but is definitely an accurate and reliable choice for anyone working in structural inspection industries. With the Protimeter you can rapidly assess the level of any building moisture with pinpoint accuracy. It comes with a convenient pouch, perfect for safely transporting your moisture meter from one location to another, spare pins and is fitted with a 9V battery. This also makes a perfect DIY gift for men in your life. A Moisture Meter is a highly useful tool for providing an approximate reading of the content of moisture in the wood. Based on the level of that reading, you can then determine whether the wood you have is suitable for the intended purpose or not which is particularly important if you plan using wood within a design planning project where the dimensions of the wood might be affected by changes in humidity for example. Wood is commonly used in all kinds of domestic as well as construction scenarios from making floors and furniture to a favorite building material so knowing the state of the wood’s moisture content can be vital. The ideal state of moisture in wood is known as the EMC or equilibrium moisture content. When wood is in balance with its surroundings and environment, it neither loses nor gains in moisture content and has the ideal EMC. A Moisture Meter then is a highly useful tool for anyone working with wood. As with all our comprehensive buying guides, competitive research and careful evaluation of reviews from customers and professionals form the basis of our analysis. We choose our products on the basis of good feedback, competitive and realistic pricing as well as being quality goods with high production values. A representative range is selected that offers value, choice, convenience, and quality from a handful of well established and sometimes lesser known brands that all have these core features in place. We appreciate that not everyone has access to the same budget so there will always be the Best Choice and the Best Value recommendation as well as our Premium Pick. If you are looking to purchase a Moisture Meter, then it is our aim, through our Best of Guide, to highlight choices that we hope you will find worthy of investing your own cash into. Roughly speaking within the woodworking industry there are two main types of moisture meter on offer; the pin and the pinless type. Both, of course, exist to fulfill one principal function; to detect the level and degree of moisture present in wood and utilize either an electromagnetic field (pinless) or an electric current (pinned). Let’s delve in further and review some of the key distinguishing features a Moisture Meter should ideally have. Pins - You may also see a pin style Moisture Meter referred to as a resistance meter. The beauty and benefit of this kind of meter are that it can take a reading from any type and size of wood, regardless of its shape, texture or size. In order to do so, you do need to push the pins physically into the wood at various strategic points in order to capture the dimension you wish to monitor. A direct current is then initiated which subsequently travels from one pin to the next. The resistance it meets en-route is translated into the level of moisture content present in that piece of wood. Pinless - Pinless meters are also referred to as electromagnetic field meters, and their big advantage is that they can scan the water content of an entire board without having to pierce the wood itself. How they work is by emitting an electric wave which is passed through a sensor that presses the wood again. Depending upon the moisture content present in the wood, the behavior of the electromagnetic field changes. Pinless meters are able to measure the wood’s capacity to store energy which is known as capacitance. The resistance of the wood to the electromagnetic field is referred to as impedance and the power absorbed by the wood is described as power loss. These calculations are all used in determining the moisture content present. Pinless meters also have the advantage of being portable which means you can take your meter with you whenever you wish to purchase any wood and test it there and then to be sure that it is suitable for your requirements. Accuracy & Temperature Correction - The accuracy of your moisture meter and the reading that it provides are going to mainly be affected by two factors, the wood density as well as the temperature. If you are checking the moisture of a different species of wood to the one that your moisture meter has initially been set p to accommodate, then you will need to bear in mind that your settings will need to be adjusted to record an accurate temperature. Usually, as their default setting, meters are et to read the moisture content of a Douglas Fir in a temperature of around 68 degrees Fahrenheit. Some of the more sophisticated water meter’s will come with built-in species and temperature correction settings so that you can easily adjust them which is especially useful if you are going to be working with a bulk amount of wood from a variety of species. You may struggle to take accurate readings otherwise so if you know that you are working in different temperature environments and with a range of wood sources, and adjustable temperature correction setting is definitely worth having. Also note that pin meters tend to be more sensitive to temperature conditions than pinless meters but conversely pinless meters are more sensitive to density variations, so again, it pays to get clear first on when and how you will be more frequently using a moisture meter so that you can ensure that you invest in the one that is best for your desired purposes. Moisture Content Range - In order to deliver an accurate reading, a range of somewhere between 7 and 20% moisture content is recommended. If you purchase a meter with a moisture content above this range, be prepared to get some erroneous readings and more than the occasional anomaly! A higher moisture range reading may, however, be useful if you do dry your own wet wood. Pin Length - Probably the most important consideration when purchasing a water meter is going to be whether you want a pin or pinless variety and in order to answer that question, it’s best to understand what kind of wood you’ll be more regularly handling and the conditions in which you will be working. Besides that key consideration, the pin length is also something that you may want to take into account and generally speaking, there is a rule which states that the average moisture content depth of a board is roughly equal to a quarter or fifth of the thickness of that board. Therefore, if you are working mostly commonly with boards which are 1.5 inches in thickness, then to get an accurate and consistent moisture reading, you will need to have a meter with pins that are 0.312 inches. It’s not an exact science, but it is a sound rule of thumb the can help eliminate some of the guesswork. Displays - When it comes to the types of display that moisture meters are most commonly fitted with, there are four main options to choose from. Also, pay attention to the screen size and resolution as this will affect the clarity and accuracy of your overall readings and how user-friendly they are. Q: What is a normal reading on a moisture meter? A: Most moisture meters have been calibrated to work on wood which means that they are generally very effective at providing a reliable and accurate reading of wood moisture content. Typically, the scale reads from 5% to 40% range. When testing moisture content in non-wood materials like concrete, you might need a device that can range from 0% (or bone dry) up to 100% (saturated). A range of 5% to 12% is considered to be an optimal reading. 6% to 8% is ideal for indoors wood flooring, 6% to 9% for furniture and 9% to 14% for construction sites. Any reading that is above 17% would be an indication of saturation and a cause for concern and the need to take preventative measures to eliminate the risk of any future moisture buildup before replacement becomes the next inevitable step. If you are in the 12% to 17% bracket, that’s still considered acceptable, but regular monitoring is recommended. Q: How do you test for moisture in wood? A: You can quickly test for moisture in all kinds of wood by merely using one of our best water meter recommendations. Originally, the process used to be a very manual and time intensive one which involved a cycle of oven drying followed by weighing of the wood to establish the difference in weight. That method is slow, unreliable, can render the wood unusable and requires a specific type of over or kiln. Using a moisture meter is far easier, more reliable and certainly takes next to no time at all to record a reading. Whether you go for a pin or pinless model, they are both fast, accurate, portable and convenient ways to test for moisture content in wood while you are on the go.